A sweeping epic of the Viking Age, Grettir's Saga follows the life of the outlaw Grettir the Strong as he battles against sorcery, bad luck, and the vengefulness of his enemies. Feared by many, Grettir is a warrior and also a poet and a lover. Unable to resolve the dispute that has outlawed him, he lives outside the bounds of family life and he roams the countryside, ridding Iceland and Norway of berserker warriors, trolls, and the walking dead. The saga presents a poignant story of medieval Icelandic society, combining details of everyday legal disputes with folklore and legend. With its scathing humor, explicit verses, and fantastic monsters, Grettir's Saga is among the most famous and widely read of Iceland's epics. In addition to Jesse Byock's lively new translation, this edition includes extensive maps, genealogies, illustrations, a chronology and glossary, as well as helpful notes, an up-to-date bibliography, and thorough introduction exploring the saga in the context of other works of Icelandic and medieval literature. 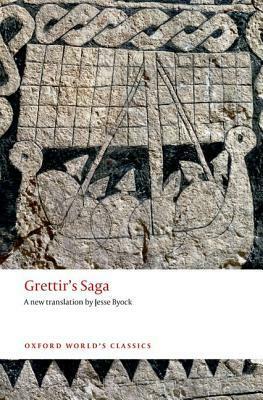 Grettir's Saga is one of the most famous Icelandic sagas, so I regret how long it's taken me to get to it. I seem to have read the obscure ones first! I enjoyed every minute of this tale, which blends a standard outlaw narrative with elements of the supernatural. Byock's translation flowed beautifully, though I regretted the loss of the proper Icelandic spellings of names and places. The notes in this edition were also excellent. In particular, I appreciated the maps and genealogy charts. If you are new to the Icelandic sagas, this would probably be a good one with which to start since it's a fun and feisty narrative and the familial relationships don't get too complicated.